The VEGAboard contains the RV32M1 SoC, featuring two RISC-V CPUs, on-die XIP flash, and a full complement of peripherals, including a 2.4 GHz multi-protocol radio. It also has built-in sensors and Arduino-style expansion connectors. The two RISC-V CPUs are named RI5CY and ZERO-RISCY, and are respectively based on the PULP platform designs by the same names: RI5CY and ZERO-RISCY. RI5CY is the “main” core; it has more flash and RAM as well as a more powerful CPU design. ZERO-RISCY is a “secondary” core. The main ZERO-RISCY use-case is as a wireless coprocessor for applications running on RI5CY. The two cores can communicate via shared memory and messaging peripherals. Currently, Zephyr only supports RI5CY with the rv32m1_vega_ri5cy board configuration name. Support for ZERO-RISCY is planned. The VEGAboard includes the following features. RV32M1 SoC pins are brought out to Arduino-style expansion connectors. These are 2 pins wide each, adding an additional row of expansion pins per header compared to the standard Arduino layout. They are described in the tables in the following subsections. Since pins are usually grouped by logical function in rows on these headers, the odd- and even-numbered pins are listed in separate tables. The “Port/bit” columns refer to the SoC PORT and GPIO peripheral naming scheme, e.g. “E/13” means PORTE/GPIOE pin 13. Pins with peripheral functionality may also be muxed as GPIOs. Note that the headers at the bottom of the board have odd-numbered pins on the top, unlike the headers at the top of the board. Even/bottom pins: note that these are mostly power-related. For an up-to-date description of additional pins (such as buttons, LEDs, etc.) supported by Zephyr, see the board DTS files in the Zephyr source code, i.e. boards/riscv32/rv32m1_vega/rv32m1_vega_ri5cy.dts for RI5CY. See the schematic in the documentation available from the OpenISA GitHub releases page for additional details. The RI5CY core is configured to use the slow internal reference clock (SIRC) as the clock source for an LPTMR peripheral to manage the system timer, and the fast internal reference clock (FIRC) to generate a 48MHz core clock. The USB connector at the top left of the board (near the RESET button) is connected to an OpenSDA chip which provides a serial USB device. This is connected to the LPUART0 peripheral which the RI5CY core uses by default for console and logging. The OpenSDA chip cannot be used to flash or debug the RISC-V cores. See the next section for flash and debug instructions for the RISC-V cores using an external JTAG dongle. A JTAG dongle is not included with the board itself. Before programming and debugging, you first need to get a GNU toolchain and an OpenOCD build. There are vendor-specific versions of each for the RV32M1 SoC. Download and extract the archive for your system, then extract the toolchain and OpenOCD archives inside. You put the extracted toolchain at ~/riscv32-unknown-elf-gcc on macOS or Linux, and C:\riscv32-unknown-elf-gcc on Windows. You put the extracted OpenOCD binary at ~/rv32m1-openocd on macOS or Linux, and the OpenOCD folder into C:\rv32m1-openocd on Windows. If you put the toolchain somewhere else, you will need to change the CROSS_COMPILE value described below accordingly. If you put OpenOCD somewhere else, you will need to change the OpenOCD path in the flashing and debugging instructions below. Don’t use installation directories with spaces anywhere in the path; this won’t work with Zephyr’s build system. See Appendix: Building Toolchain and OpenOCD from Source. This section describes how to connect to your board via the J-Link debugger and adapter board. See the above information for details on required hardware. 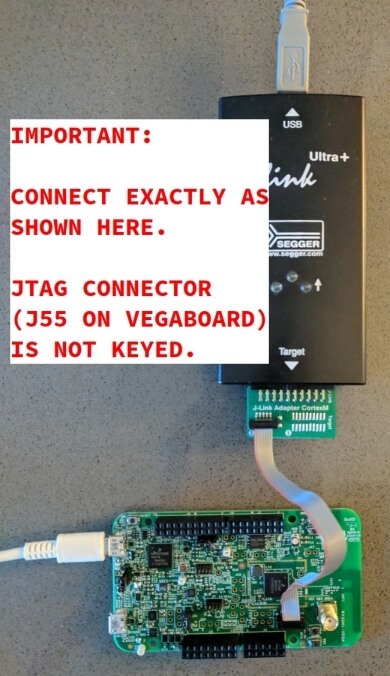 Connect the J-Link debugger through the adapter board to the VEGAboard as shown in the figure. VEGAboard connected properly to J-Link debugger. VEGAboard connector J55 should be used. Pin 1 is on the bottom left. Power the VEGAboard via USB. The OpenSDA connector at the top left is recommended for UART access. Make sure your J-Link is connected to your computer via USB. Next, you’ll need to make sure your board boots the RI5CY core. You only need to do this once. 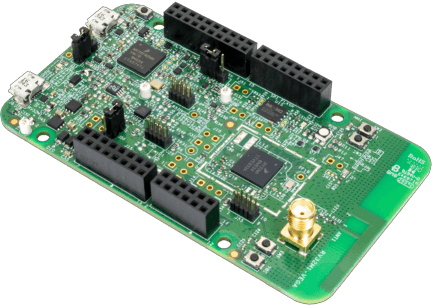 The RV32M1 SoC on the VEGAboard has multiple cores, any of which can be selected as the boot core. 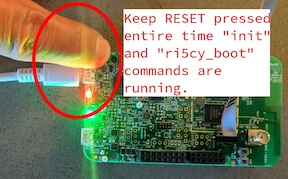 Before flashing and debugging, you’ll first make sure you’re booting RI5CY. Linux users: to run these commands as a normal user, you will need to install the 60-openocd.rules udev rules file (usually by placing it in /etc/udev/rules.d, then unplugging and plugging the J-Link in again via USB). These Zephyr-specific instructions differ slightly from the equivalent SDK ones. The Zephyr OpenOCD configuration file does not run init, so you have to do it yourself as explained below. The reset button is at top left, as shown in the following figure. Now quit the telnet session in this terminal and exit OpenOCD in the other terminal. Unplug your J-Link and VEGAboard, and plug them back in. Connect to localhost port 4444 using telnet. Run init and ri5cy_boot as shown above, with RESET held down. Quit the OpenOCD and telnet sessions. These instructions assume you’ve set up a development system, cloned the Zephyr repository, and installed Python dependencies as described in the Getting Started Guide. You should also have already downloaded and installed the toolchain and OpenOCD as described above in Get the Toolchain and OpenOCD. The above only sets these variables for your current shell session. You need to make sure this happens every time you use this board. Due to a toolchain linker issue, you need to add an option setting CMAKE_REQUIRED_FLAGS when running CMake to generate a build system (see Application Development for information about Zephyr’s build system). cmake -GNinja -DBOARD=rv32m1_vega_ri5cy -DCMAKE_REQUIRED_FLAGS=-Wl,-dT=/dev/null ..
cmake -GNinja -DBOARD=rv32m1_vega_ri5cy -DCMAKE_REQUIRED_FLAGS=-Wl,-dT=empty.ld ..
Make sure you’ve done the JTAG setup, and that the VEGAboard’s top left USB connector is connected to your computer too (for UART access). Make sure you’ve followed the above instructions to set up your board and build a program first. Since you need to use a special OpenOCD, the easiest way to flash is by using west flash instead of ninja flash like you might see with other Zephyr documentation. Run these commands from the build directory where you ran ninja in the above section. # Don't use "~/rv32m1-openocd". It won't work. Make sure you don’t have another openocd process running in the background. Unplug the boards and plug them back in. On Linux, make sure udev rules are installed, as described above. As an alternative, for manual steps to run OpenOCD and GDB to flash, see the SDK README. You can then set breakpoints and debug using normal GDB commands. OpenISA GitHub releases: includes toolchain and OpenOCD prebuilts, as well as documentation, such as the SoC datasheet and reference manual, board schematic and user guides, etc. Base toolchain: pulp-riscv-gnu-toolchain; extra toolchain patches: rv32m1_gnu_toolchain_patch (only needed if building from source). OpenOCD repository: rv32m1-openocd (only needed if building from source). Vendor SDK: rv32m1_sdk_riscv. Contains HALs, non-Zephyr sample applications, and information on using the board with Eclipse which may be interesting when combined with the Eclipse Debugging information in the Application Development. Toolchain and OpenOCD build instructions are provided for Linux and macOS only. Instructions for building OpenOCD have only been verified on Linux. Users of other Linux distributions need to install the above packages with their system package manager. If you set <toolchain-installation-dir> to ~/riscv32-unknown-elf-gcc, you can use the above instructions for setting CROSS_COMPILE when building Zephyr applications. If you set it to something else, you will need to update your CROSS_COMPILE setting accordingly. Strangely, there is no separate make install step for the toolchain. That is, the make invocation both builds and installs the toolchain. This means make has to be run as root if you want to set --prefix to a system directory such as /usr/local or /opt on Linux. If <openocd-installation-dir> is ~/rv32m1-openocd, you should set your OpenOCD path to ~/rv32m1-openocd/bin/openocd in the above flash and debug instructions. For Linux users, the RISC-V toolchain in the Zephyr SDK may work, but it hasn’t been thoroughly tested with this SoC, and will not allow use of any available RISC-V ISA extensions. Support for the RV32M1 SoC is not currently available in the OpenOCD upstream repository or the OpenOCD build in the Zephyr SDK.